Juma’ani (front row, second left) shows Rohani the book given to her as a souvenir while Rosey (fourth right) and other Sabati exco members look on. MIRI: Ministry of Women Development, Family and Community plans to set up autism centres in Sarawak and Sabah. Its minister Datuk Seri Rohani Abdul Karim said the first autism centre under Permata Kurnia would be a model for other centres in the two states. “I’ve informed Prime Minister Datuk Seri Najib Tun Rajak and wife Datin Seri Rosmah Mansor who is patron of Permata that at least one such centre should be set up in Sarawak and Sabah,” she told a press conference after officiating at an autism seminar at Pullman Hotel here yesterday. Rohani who is also Batang Lupar MP said they both agreed with her suggestion but the PM told her of a need to improve the existing autism centre in Sentul, Kuala Lumpur set up last year. She said 250 students registered with the centre in Sentul which provides daycare services. The number registered is at its maximum capacity. This centre conducts weekend special classes to which parents from as far as Terengganu bring their autistic children. The centre offers online classes for registered students so their parents need not have to bring them daily for special care and classes at the centre. She said the autism seminar is part of the ministry’s outreach programme to increase awareness on the need to send autistic children for training and education. 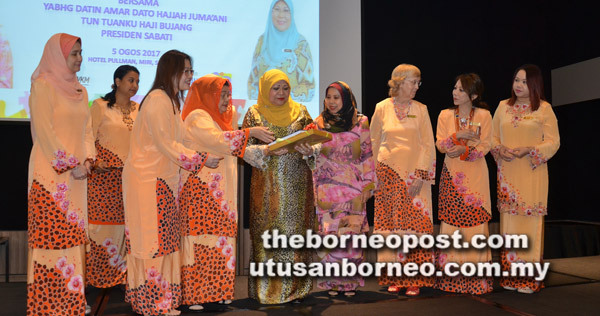 She praised Association of Wives of Ministers and Assistant Minister Sarawak (Sabati) for organising the autism seminar in Miri. She welcomes non-governmental organisations (NGOs) in the state to work with the ministry to conduct more outreach programmes related to people with physical and mental disabilities. The next autism seminar will be conducted in Sibu where the director for the autism centre in Sentul would be invited to deliver a topic. The present one-day seminar was attended by 180 participants from Miri and Bintulu comprising parents and Community Rehabilitation Centre (PDK). Present were Sabati president Datin Amar Datuk Juma’ani Tuanku Bujang who is wife of Chief Minister Datuk Amar Abang Johari Tun Openg; Assistant Minister for Women, Family and Childhood Development Rosey Yunus; Lambir assemblyman Ripin Lamat, Sabati exco members and Miri District Officer Mohd Yusuf Abdul Aziz.